They were men and women, children and adults, clergy and laypeople, commoners and kings, yet they had one thing in common---God was first in their lives. Excerpted from the 12-volume Butler's Lives, 365 biographical sketches of the canonized offer daily encouragement as you wholeheartedly seek to serve Christ. 625 pages, hardcover from Liturgical Press. 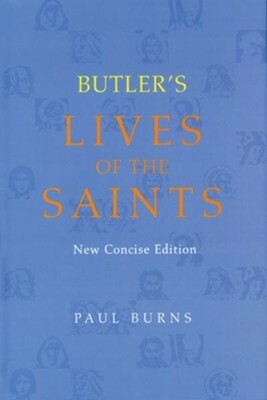 This new concise Butler's provides an essay on one saint for each day of the month, using the twelve-volume full edition of Butler's Lives of the Saints as a source. Selections are made from both categories of Saint" and *Blessed - - canonized and beatified, allowing for the increasing proportion of women and of new- and third-world holy people. Completely rewritten in a popular style, this volume also has more *spiritual - appeal than the full edition. A prayer and intercessory reflection is included after each entry, which lend themselves to family or small-group meditation as well as to individual devotion. The volume also suggests baptismal/confirmation names for the day's commemorations or for inclusion in prayers. Paul Burns is the general editor of theButler's Lives of the Saints series published by Liturgical Press. I'm the author/artist and I want to review Butler's Lives of the Saints: New Concise edition.